As a focal point of a kitchen or bath, cabinets should be attractive, functional and durable. The best kitchen cabinets are custom made with high-quality materials. Prefabricated or boxed cabinets are built with lower-grade, thinner materials often overlaid with a wood veneer. 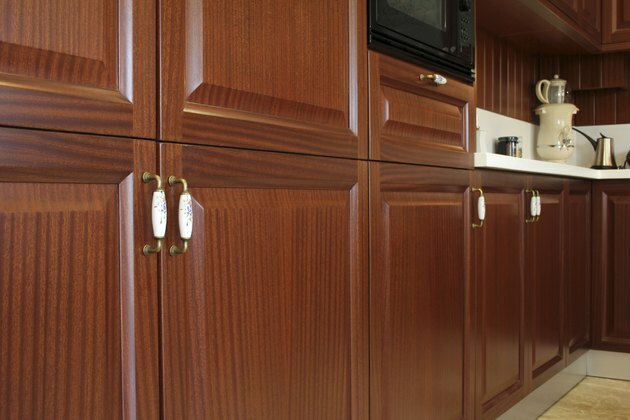 Cabinets are built with a mixture of plywood and hardwood solids, and both materials matter when choosing what's best. Solid raised-panel doors can be expensive. Plywood is an engineered glued and laminated wood overlaid with a hardwood veneer typically less than1/16-inch. The appearance of it is the only relevant difference when comparing equal grades -- important for determining quality and cost. Plywood designated AA or premium is the most expensive. Sometimes referred to as one-piece face, the veneer is rotary cut in a single piece to prevent splicing. Grade A plywood is less expensive, with visible veneer layers spliced side-by-side and color-matched for consistency. Grades B, C, D and E descend in cost and appearance with each lower grade having additional streaks or inconsistent colors. Economy or shop-grade plywood is the cheapest with allowed defects or damage. At least 85 percent of shop-grade plywood is typically usable with a good cabinetmaker working around the defects. Face frames and cabinet doors often consist of solid hardwoods. Species such as maple, beech or hickory resist denting and scratching at a higher degree than softer species such as alder, mahogany or walnut, but they also cost more. Maple and hickory for example, are two of the hardest wood species commonly used for cabinets, and are usually more expensive than softer woods such as oak or ash. But exotic or imported species -- no matter the density -- typically cost more than domestic hardwoods. Other exceptions include domestic hardwoods that have become trendy. Cherry for example, because of its warm rich color and subtle, intricate grain pattern is considered a luxury wood; it typically demands higher prices than other domestic hardwoods. Medium-priced red oak with complex flame or arched grain patterns is one of the most commonly used hardwoods by cabinetmakers. White oak presents with straighter grains, but it costs more than red oak. Other domestic species include the harder beech woods with consistent straight graining and birch with bands and streaks of brown, priced significantly lower than beech, because of its universal availability and the low cost of birch plywood. Other commonly used hardwoods include straight-grain red mahogany and the dark and rich brown walnuts. Mahogany imparts warmth to cabinets while walnut, similar in hardness and cost to mahogany, adds an elegant appearance to cabinets. Any species of hardwood can be stained to match existing colors in the home, though some react to stain better than other woods. Oak, ash and pine absorb stain at an even rate. Maple and birch may blotch if not properly prepared for stain. Cherry and walnut, known for their prominent color, are sometimes better left as-is. From cone-bearing evergreen trees come the softwoods, typically used for structural purposes. When used in cabinetry, softwood such as pine lends ambiance to cottages, lodges, cabins and country settings with its knotty character and soft, amber tones. Other softwoods such as fir and spruce are straight-grained, somewhat characterless, but harder and tougher than pine. These two are typically used for economy or utility applications, such as in garages or shops. Which Wood Is Harder, Oak or Maple?